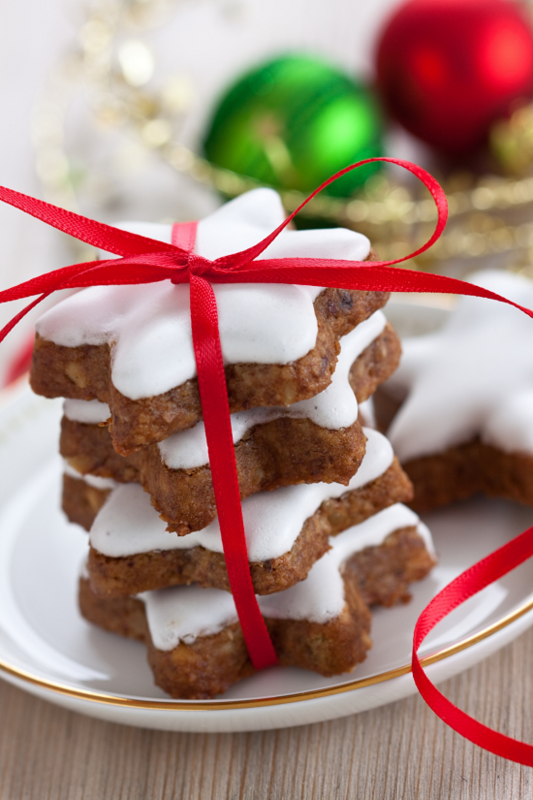 Zimsterne German Cinnamon Stars are a classic Christmas cookie which originated in Bavaria. 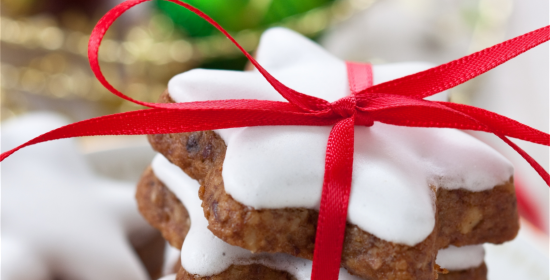 This cookie recipe is gluten-free. DIRECTIONS—sift confectioners’ sugar. Add nuts to food processor and process into flour. Add 1/3 cup of sugar and cinnamon, mix well. Set aside. In bowl of stand mixer or in large glass bowl, using hand mixer, beat egg whites on high speed about 1 minute, until soft peaks form. Continue beating and slowly incorporate remaining sugar. Beat for an additional 2 minutes or until stiff peaks form and you have meringue. Measure and reserve 1/4 cup to use on top of cookies [cover and refrigerate]. Add lemon zest and fold into remaining meringue along with almond and sugar mixture. Mix well, into a stiff dough. Dust large piece of parchment paper with powdered sugar, turn dough onto paper, flatten it, dust with more sugar, as needed. Cover with second piece of parchment paper. Roll dough out between sheets of parchment paper to 1/4” thickness. Lift off top parchment paper and discard. Dust dough with powdered sugar, cover with a clean sheet of parchment paper. Gently flip dough over then carefully peel off top [former bottom] piece of paper. At this point, letting the dough air dry awhile, makes for easier cutting. Preheat oven to 250 ºF. Cut out cookies, using a 3 inch star-shaped cookie cutter. Place on baking sheet lined with clean piece of parchment paper. Using a small butter knife or brush, spread a bit of remaining meringue on top of each cookie, taking care not to let it drip over sides. Bake 30 minutes or until meringue is set and bottom of cookies are lightly browned. Turn off oven, and with door ajar, leave cookies in oven another 10 minutes. Cool cookies completely before serving. Gather excess dough and repeat process.